Looks like Bradley Cooper and Lady Gaga are far from the shallow now. On Saturday night, during her Enigma set at the MGM Park Theatre in Las Vegas, the “Poker Face” pop star summoned the 44-year old actor and filmmaker from the audience to the stage for an unexpected, but highly anticipated duet of “Shallow,” their critically-acclaimed hit from their 2018 film and soundtrack A Star is Born. Wearing a huge smile and dressed in leather coat and jeans, Cooper rushes to the stage and is greeted with a loud roar of applause and cheers from the audience. Cooper then plugs in his ear piece, engages the crowd in a little humor (“Jackson never used these”) and then greets with the audience with “Hello Vegas.” The two embrace, hug and go into the song in the same vein of the album version. 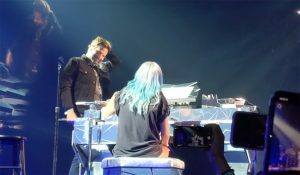 Gaga belts her parts while playing the piano as Cooper swarms around her, even playing air guitar with rock star enthusiasm. He does fumble slightly on the first chorus when executing the “sha-a-ah-h-low” chants, but releases a light giggle as he finds his pace again. Before it ends, the two warmly embrace on the piano bench, reminiscent of the romance portrayed by Ally and Jackson, their characters in the film. If you’ve been living under a rock for a while, you might’ve lost count of all the award buzz surrounding the film and its soundtrack. The film recently picked up eight Oscar nods, including Best Picture, Best Adapted Screenplay and Best Cinematography. Gaga and Cooper are also nominated for Best Actor and Best Actress, while “Shallow” is also up for Best Original Song. Despite getting four Golden Globe nominations and walking away with nada, a swarm of critics believe A Star is Born will rack up further in award season. There’s no time like the right time to do a good thing. And with the Oscar buzz now surrounding them, the mood was right for the singer-songwriter pop star and film director to give their fans an extra special something. Let’s hope more of this is to come. And Cooper brings us more of that musical magic.